Hey Busy Being Jennifer reader! Kristin from Orville Redenbacher’s here. 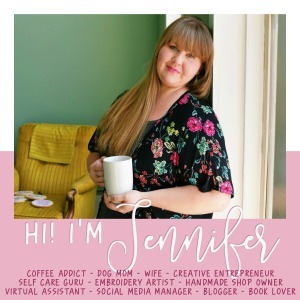 I am excited to be writing for Jennifer today! Before I share my Halloween recipe, let me tell you a little more about myself… I live in Chicago with my dog, Joey. If you’ve never been to the Windy City—there’s always something going on! I mix it up on the weekends by checking out exhibits at the Art Institute, trying a new restaurant or going for a run along Lake Shore Drive. I cannot wait for my favorite holiday of the year—Halloween! I love to dress up in a different costume every year. I’ve done everything from a blood-sucking vampress to Lady Gaga’s motorcycle-chic Judas getup. Whether you are trick-or-treating with the little ones or attending a friend’s spooky party, Halloween is not the same without some sweet treats! Change it up from classic candy corn to some Oooey-Gooey Popcorn Balls. What I love most about these popcorn balls is that I can wrap them in cellophane to create popcorn pumpkins. See instructions below the recipe! Prepare popcorn according to package directions. Once popped, transfer to a large heatproof bowl; remove all unpopped kernels. In a medium-sized microwave-safe bowl, heat butter until melted. Add marshmallows and peanut butter; microwave until marshmallows appear puffed. Pour marshmallow mixture over popcorn; stir well until popcorn is coated. Use hands to form popcorn mixture into 2-1/2-inch balls; roll firmly. *When creating pumpkin popcorn balls, bring out vibrant orange coloring by adding orange food coloring to the marshmallow mixture before mixing with the popcorn. Individually wrap each popcorn ball in orange cellophane. When wrapping, bunch the sides of cellophane around each popcorn ball and tie with a black ribbon. Cut out Jack-o-lantern eyes, noses and mouths from black construction paper and tape onto the cellophane. There you go! Treat your ghouls and gals to these festive Oooey-Gooey Popcorn Balls. If you want more buttered popcorn ideas and easy snack recipes, check out the Orville Redenbacher’s site! Make your own Oooey-Gooey Popcorn Balls! They’re the perfect #Halloween Treat! Oh yum yum yum!! I love popcorn balls, and with peanut butter?? I’m making these tomorrow! I love popcorn balls to Krista. Let me (or us) know how your peanut butter p/ balls turn out. Thanks! I love popcorn balls this time of year. I have never seen a recipe with peanut butter. sounds yummy. thanks for sharing. I like this idea better than trying to make candy coating, easy to make and easier on the teeth. Thanks for sharing on Creative K Kids’ Tasty Tuesdays link up. Hope to see you back next week. Oh I LOVE popcorn balls! I use to have at least one every Halloween when growing up, but haven’t had one in years. I should make some and keep them all to myself (-; Thanks for the memories,and sharing your recipe. These are perfect for move night. Thanks for sharing on Sunday’s Best linkup. These look delicious! What a fun Halloween treat. Your popcorn balls are one of our features at today’s Snickerdoodle Sunday Party. Looks yummy. Pinned & shared. Thanks for joining the Inspiration Spotlight Party. See you again soon.